The Blowing Rocks community is located in the beautiful city of Hobe Sound, tucked in between the Indian River Intracoastal Waterway and Atlantic Ocean on the beautiful Jupiter Island. Directly on Beach Road, the homes for sale in Blowing Rocks offer your own personal beach with a backyard of more pristine water views. These custom built homes, some of which have a Mediterranean style, offer magnificent ocean to Intracoastal island estates ranging in price of $4 million to over $10 million dollars with 7,000+ sq. ft. of space. Plus it offers a boat dock on the Intracoastal that can accommodate up to 4 boats. Its a small exclusive community of several beachfront homes just north of the famous Blowing Rocks Preserve Beach known for waves crashing into huge limestone rocks. Blowing Rocks is nestled directly East of the Jupiter Hills Village community that boasts the famous Jupiter Hills Golf Club golf course in Tequesta, separated only by the Indian River Intracoastal Waterway. Additionally, Blowing Rocks homes are just north of Jupiter Inlet Colony and borders the cities of Tequesta and Jupiter, offering residents a close proximity to great golfing, shopping, restaurants and of course the most amazing beaches. 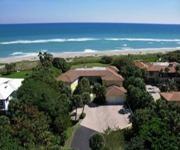 These Blowing Rocks homes are just 25 minutes to Palm Beach International Airport. Entertain family and friends in a private tropical setting all while relaxing and enjoying the ocean views! Click any of the buttons below to view current available Blowing Rocks homes for sale or Blowing Rocks homes for rent in Hobe Sound. If there is any house you would like more information on in the Blowing Rocks community, call us at (772) 334-8600 or email us.